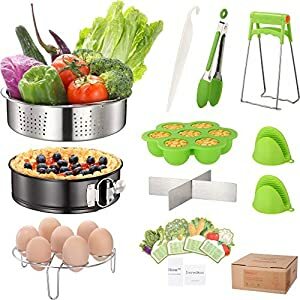 ✅ULTIMATELY COMPLETE KIT — A genuine full set 9 pieces accessory for electric pressure cooker, it contains all you need to make meals for family and friends: stainless steel steamer basket, non-stick springform buckle push pan, egg steamer rack trivet, silicon egg bites mold, removable divider, bowl clip, silicone clamp, cake stripping knife and silicone mitts. 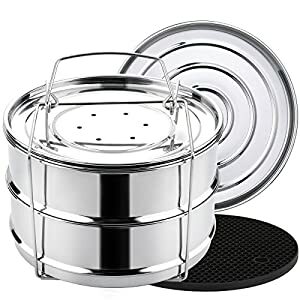 ✅MULTIPURPOSE & EASY TO USE — The set can cook a variety of mind-blowing foods simultaneously, often in less time compared to standard cooking methods, excellent choice for steaming vegetables, rice, meat, and fish, reheat your food without losing it’s original flavor and nutrients，so you can avoid the microwave, the more you use the more you just realize just how versatile it really is, and it’s so easy to use. 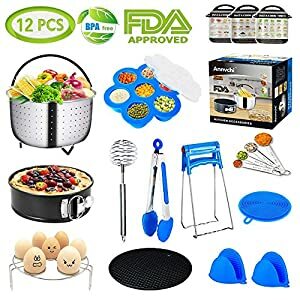 ✅PREMIUM QUALITY & SAFE — Made from high quality food grade 304 stainless steel and BPA free silicone, sturdy and durable, easy to clean, dishwasher safe, with FDA certified and environmentally safe. 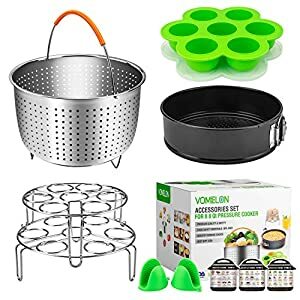 Pressure Cooker Parts: They include 1 basket steamer, 1 Non-stick springform pan/cheesecake pan, 1 steamer egg rack, 1 silicon egg bites mold, 1 kitchen tongs, 3 magnetic cheat sheets, 1 plate dish clip/bowl clip, 1 whisk, 1 measuring spoon, 1 trivets mat, 1 silicone scrub pad and 2 silicone oven mitts. 2019 new upgrade: The steamer basket upgrade silicone feet. Prevents scratching Small appliances and makes cleaning easier. They are healthy cooking choice because it helps retain more than 90% of the nutrients lost when either boiling or microwaving food. Multi-Function cooking purposes: The springform cheesecake pan provides you lots of happy rice cooker baking experience, which is great for assorted recipes of cakes and cheesecakes.It is a cake maker, and also a egg maker. Egg bites mold can be used for ice-cubes, finger foods, jelly, pudding, mini-muffins, cupcakes, sauces, also can be used as child snack tray, a best choice to make baby child adjuvant food.